I once dreamed of playing in a band: of making records, of touring, of creating something I could be proud of and that others would love. However, I gave up on that dream a long time ago, and I never really thought of myself as a songwriter. That was something others did. I was a spectator, or, at best, just the bass player. However, a few years ago, inspired by Tolkien’s idea of subcreation, I picked up a guitar and started playing again for the first time in ages. This time around, the songs seemed to pour out of me. Before long, I was starting to think of my songwriting as something I could actually share with others. “Vingilot” (below) is the first-fruits of that work. I have so much more to tell you, but I don’t want to say too much, at least not yet. The music should speak for itself, so I hope you’ll check out “vingilot”. It’s an instrumental; I’d even call it a musical manifesto with no words (er, Tolk-Rock?). Lyrics will come later, but I think “vingilot” speaks for itself. I hope you’ll dig it, and let me know if you do (comment, share, email, buy/donate, etc). More to follow very soon. rysowAnia is my Tolkien Artist of the Month. Last week, I considered “Two Trees of Valinor“, her depiction of Yavanna among her two most magnificent creations, Laurelin and Telperion. This week, I consider “Laughter is stilled“, which depicts a young Túrin in agonizing sorrow. Looking through rysowAnia’s gallery I’ve glanced this image dozens of times without really seeing it. 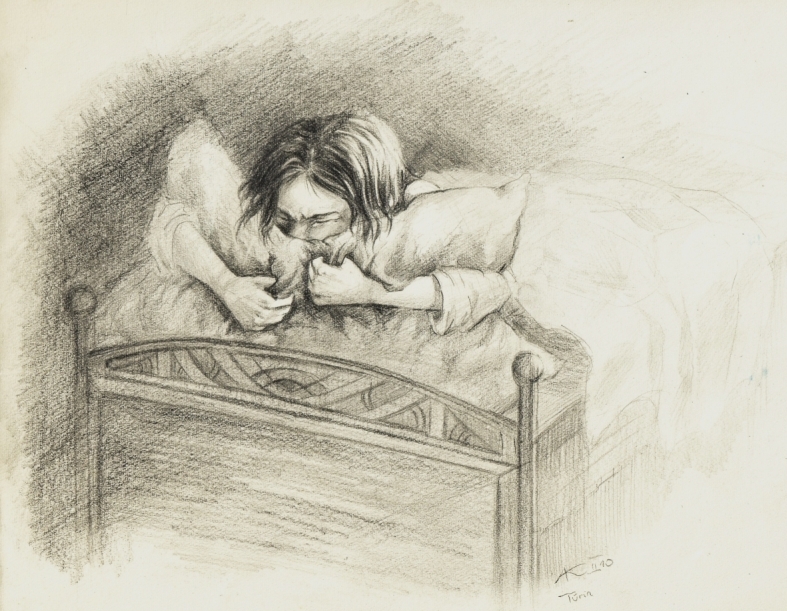 For the longest time, I didn’t even realize it was a “Tolkien” image, and actually assumed it was simply a perceptive image of a child using a pillow to keep from bursting out loud with laughter. Boy was I wrong! No, this is not some generic and sentimental “childhood” image, but a depiction of heartbreaking grief and tragedy. The subject is a young Túrin, shortly after the death of his sister Lalaith (“laughter”). One can only imagine the pain and rage the pillow muffles, what tears it absorbs. This is a picture of sorrow at its most extreme, and humanizes the burden Túrin must have carried into the ever-increasing tragedies of his life. This kind of event damages a person, perhaps even breaks them. And Túrin, it would seem, really had no one to put him back together again. I was fooled because you just don’t see these types of images with Tolkien’s work, but the story of Túrin is unusual in that regard anyway. It is perhaps the most human story of the first age, entwined as it is with inescapable sorrow and grief. With all of the tragedies in our own twisted world, it often seems triumphant that we can even find the the emotional and spiritual room to laugh. It’s a necessary thing, a sort of spiritual immune system, to grasp laughter and humor, a means of lightening the heart, but for Túrin, it’s as if the laughter of life had been completely destroyed with the death of his dear Lalaith. Perceptive work here indeed. 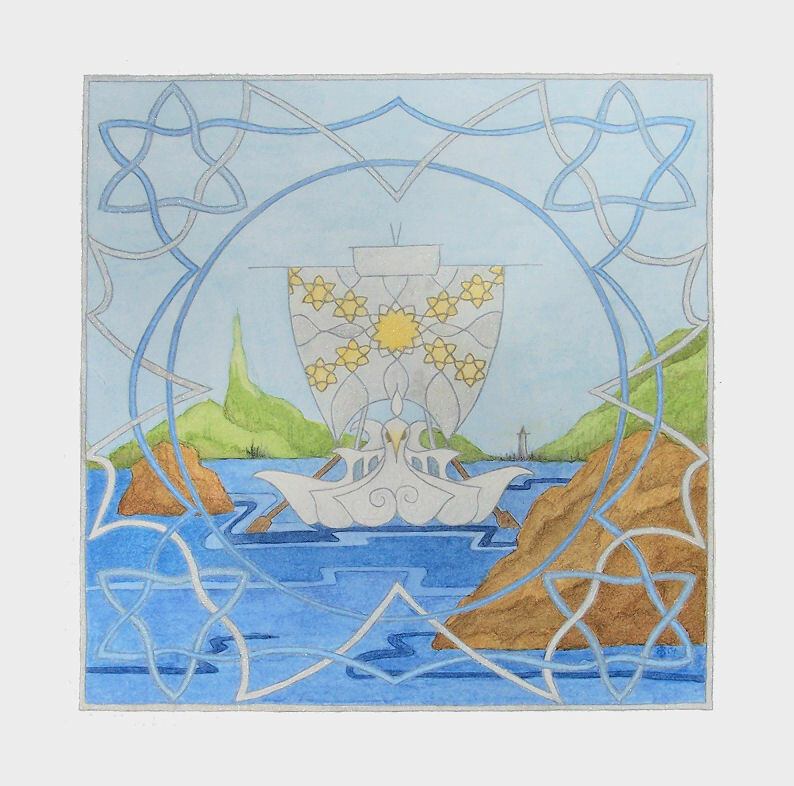 Next week I’ll begin featuring a new Tolkien Artist-of-the-Month. Until then, please go check out more of rysowAnia’s work, and leave her comments on the pieces you enjoy! rysowAnia is my Tolkien Artist of the Month. Last week, I considered “Looking into the Stone“, her depiction of Denethor under the spell of his precious Palantír. This week, I consider “Two Trees of Valinor“, which depicts Yavanna among her two most magnificent creations, Laurelin and Telperion. I really love rysowAnia’s impressionistic style when it comes to the Valar and the things of their mythology. The thing is, the Two Trees are not depicted here in terms of Tolkien’s own description, at least not in a realist sort of manner. Instead, we see their difference in terms of their shape, and in a way, they even seem each to foreshadow one of the two races of the Children of Ilúvatar. Silver Telperion, with his long, falling and fading light, seems a visual depiction of the Elves. 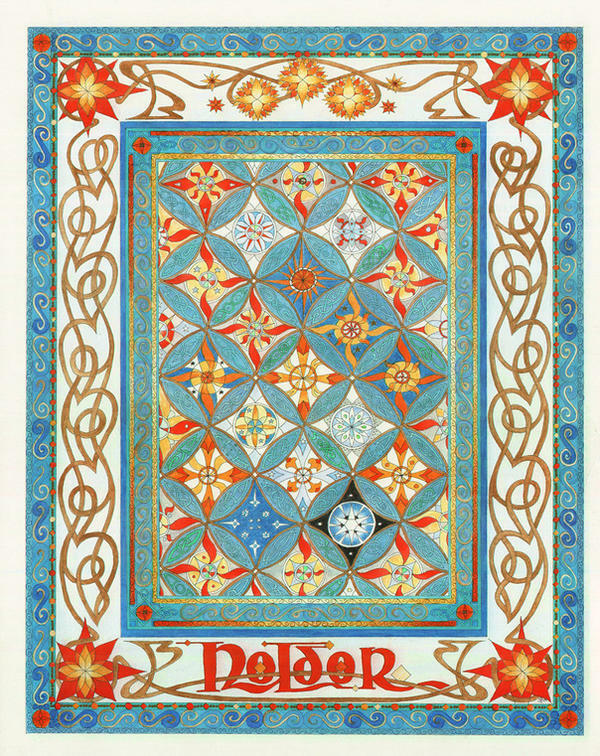 Golden Laurelin, with her small, fruitful clusters of flame, reflects the brief burst of life that is the race of Men. Furthermore, the impressionistic nature of the work causes them to blend into one another in branch and root, with both emanating at the root from Yavanna herself. They are an outpouring of her nature, a blending of her very being with the Earth, and she sings to them in order to nourish them. There are surely more literal interpretations of the Trees, but I think you’d be hard-pressed to find a visual depiction that gets closer to their spiritual heart. Tune in next week when I’ll feature another one of rysowAnia’s pieces. In the meantime, hop on over to her DeviantArt gallery and check out the rest of her work. Even as Eru smiles, he lifts up his left hand and a new theme emerges amid the storm. What do we make of this new theme? Is it a mere reaction to Melkor’s work, or is it a theme altogether distinct from the first? We are told it is “like and yet unlike” the former theme and that it “gathered power and had new beauty.” Coming as it does amidst Melkor’s cacophony, it would need to be powerful enough to emerge through that noise, the same noise that seemed to drown Ilúvatar’s first theme. As for it being “like and yet unlike” the former theme, we are not told in what way this is. Most of us probably recognize this sensation when it comes to hearing music. An artist may produce a song using a melody or riff, and then change something about it later so that it sounds the same yet, at the same time, seems altogether new. One can see this operative in James Horner’s music for The Fellowship of the Ring. Even in a short piece like “Concerning Hobbits,” the initial theme opens, and then is changed, almost transfigured, by a shift in rhythm and instrumentation. And then, further down the line, a brief twinge of sadness, a minor key, interrupts the flow and something even newer emerges. Though it would seem that Ilúvatar has produced something capable of withstanding Melkor’s assault of noise, Melkor is not finished yet. Even as the second theme emerges from the sea of sound, Melkor’s discord arises with a vengeance and an even greater war of noise results, a noise so great that many of the Ainur simply cease their playing altogether. “Who’s in charge here?” they must be wondering.